The interior is progressing nicely with most of the major hurdles thought through and a plan of attack articulated on what to do for each element of the job. With the wet weather over the last week Duncan has had few distractions and is busily making templates for trim and stitching the pieces together. The two rear side panels are finished with the exception of the carpet along the bottom edge and the speaker covers. I purchased through eBay some custom Chevrolet script speaker plates in alloy and was that impressed with the first pair I sourced another pair for the front doors. They are currently out being polished and when the interior is installed for the final time the speaker covers will be mounted. 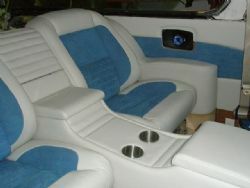 I got a call from Duncan about a drama with a bottom seat foam for the front seats. 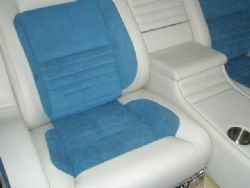 These seats originally came out of a Holden VZ one tonner and they tilt forward to allow access to the rear seats. One of the great things about these seats is they have a Velcro strip embedded in the seat foam which makes life easier for the trimmer and hopefully will eliminate wrinkles in the fabric. Duncan needed a new one. I had two options. Go out to Wetherill Park in the pouring rain and try and score a second hand seat through a wrecker or ride my luck and see if the local Holden dealer sold them as a spare part. With nothing to lose I rode my luck at Col Crawford’s at Brookvale and to my surprise they did sell them. You have to buy a complete bottom foam with a material covering but given it was a similar price to a whole second hand seat it was a no brainer. I was told it would be shipped up from Melbourne and be in tomorrow. Works for me. 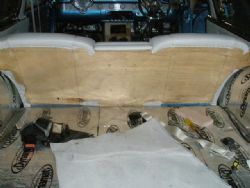 Duncan is currently stitching up the front seats and they should all be done by the end of the week. Dave has fitted the new front speakers in the door and cut out the panel for the electric window switches. This week should also see the piping around the doorframes be completed and hopefully a start on the front door panels. So far so good. 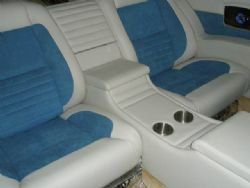 Enjoy the pictures and watch this space for more info on the interior.